Shenzhen’s very first large-scale international contemporary art biennial was announced today. 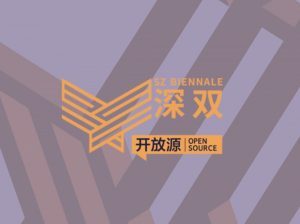 The theme of the Biennale is “Open Source”: a clear derivation from the hypertechnological world, it is through this concept that the curators believe that the individual and collective identities of the city of Shenzhen can be understood, and manifest itself in all of its different facets. On the one hand, Shenzhen is indeed China’s most high tech venue, mega companies there such as Tencent and Huawei. On the other hand, metaphorically speaking, Shenzhen is “Open Source” as it is an historically powerful trading, economic, technological and social platform. Zhong Biao & Yan Yonghong, Fan Bo, Zheng Lu, Shen Shaomin, The Tabletop Group, Yin Yanming, Ma Yansong, Chen Wenling, Jing X. Hu, Zhang Zengzeng, Xu Zhuoer, and others. David Cerny (Czech), Maurizio Donzelli (Italy), Arthur Duff (USA), Alberto Gianfreda (Italy), Yohan Han (Korea), Damien Hirst (UK), Anthony Howe (USA), Claude Lévêque (France), Francesca Pasquali (Italy), Chiharu Shiota (Japan), Charles Lindsay + Shaoyu Su (USA), Laura Renna (Italy), Stella Zhang (USA), among others. Shenzhen Bay Park. The Park stretches for 14 kilometers along the coast. Average number of visitors per year is 12 million, about one million per month. The park is designed for the recreational needs of every demographic group. Luohu Art Museum. As a non-profit art space, which integrated publicity, complexity and openness, LUOHU ART MUSEUM is actively organizing exhibition for high-end artists. The museum is designed by URBANUS, one of the most influential architecture company in China. Located at the intersection between Shennan Rd and Nanji Rd. twenty meters away from Hubei Station on Subway Line 2. Estimated number of visitors: 20,000/month, total 60,000 for the three months during the exhibition.